Today’s Apple event held at Cupertino the fruit company’s headquarter came up with a bunch of new Apple products including 27 inch iMac with retina display, The iPad Air 2 and the iPad mini 3. The list don’t end’s here there is something more what is it? Folk’s Apple has just announced Mac Mini 2014. After years Apple has come up with an update to the square box computer! What is it? Find out below! Mac mini has not received any design change physically. It still looks like a set top box for TV. However coming towards specs Apple has given it much. The Mac mini is equipped with 4th-gen Intel Core processors, fully supported by either Intel Iris or Intel HD 5000 graphics depending upon which model you choose. It is equipped with PCIe base flash storage. It comes with two thunderbolt 2 ports on-board and 4 high speed USB ports. Wi-Fi has also improved and boosted up to 802.11 ac, and performs faster than ever before. 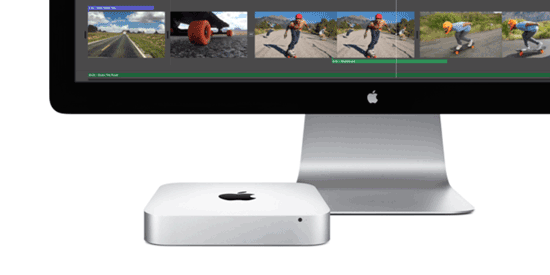 The Mac mini starts from $499 and change with your choice of options making it more affordable. Mac Mini is ready to be shipped you don’t have to wait to have your hands on new mac mini, Go order now folks.